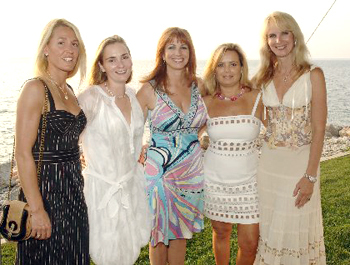 Sarah Ehrlich, Executive Director, Help for Orphans International (HFOI) and benefit chairmen Helen Gifford, Vincent Horcasitas, Sara Herbert-Galloway, and Jill Zarin hosted the organization’s summer fund raiser sponsored by Trump Vodka at Mr. and Mrs. Ehrlich’s waterside residence on Peconic Bay in Southampton on July 14th, 2007. Help for Orphans International is a non-profit organization which provides superior education facilities and materials for orphans around the world. The organization, currently working with nine schools in Kenya which cater to children left parentless by famine, civil wars, and the AIDS epidemic is building new facilities as well as renovating existing ones. More than 30 million children are orphaned throughout Africa. Ms. Ehrlich had the recent honor of addressing attendees to “A Conversation and Luncheon with Women of Color with Senator Hillary Clinton” in Washington, DC. Since its inception, HFOI is best known for providing in-depth teaching programs throughout orphanages in Africa and India. In the last eighteen months, HFOI has implemented teaching programs, complete with textbooks and resources to schools in nine Kenyan villages including Kisumu, Mbita, and Kisii. Construction of a new school designed by AB Architekten in Masai Mara will be built in ecological harmony with its equatorial location, allowing maximum use of the sun’s energy by way of rooftop photo volcanic cells. Watch the Save the Date for a HFOI benefit in Los Angeles scheduled for Feb. 2008.